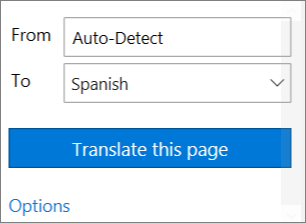 Microsoft Translator is now available in the Edge browser. Microsoft Translator for Edge is free and can be used to translate text for more than 60 languages. Look for the Translator button at the top of your Edge browser and select it. Note: If you don't see the icon at the top of your browser window, it may not be installed yet. Visit the Microsoft Store to download Microsoft Translator for free. A dropdown panel will appear allowing you to select which language you'd like the page translated to. Choose your language and then select Translate this page. If you'd like to translate a smaller chunk of text rather than a whole page, highlight the content to translate, right-click, and then select Translate text.